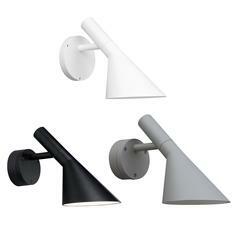 GamFratesi Black 'YUH' wall light for Louis Poulsen. Designed by Stine Gam and Enrico Fratesi, the YUH reflects Louis Poulsen’s philosophy of designing to shape light. Inspired by the classic virtues of Danish Modernism, Poul Henningsen’s philosophy about light and with Arne Jacobsen’s geometric shapes, GamFratesi pays homage to the legends and adds their own characteristic aesthetic playfulness to the new Yuh Lamp. One of the essential features of the design is that it is personal. The lamp is flexible and takes up very little space. 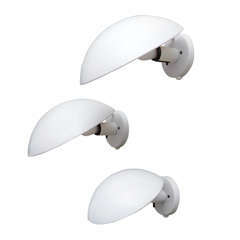 It rotates and moves up and down, illuminating and creating ambience in the required area. A lamp created just around you, it provides direct glare-free downward light. The angle of the shade can be adjusted to optimize light distribution. The slim opening at the top of the shade provides soft, ambient upward illumination. The shade pivots, rotates, and slides on the vertical stem to optimize light distribution. A mechanical system provides great freedom of movement, so the light can always be set in the ideal position in the workspace, living room etc. Built-in LED technology provides high quality light with stepless dimming down to 15%. Timer function automatically turns off the light after a chosen duration of 4 or 8 hours, or can be set to stay permanently on. Memory function allows light level to be set for each time the fixture is connected to main power. A button at the top of the tube acts as the switch and dimmer. Price is per item. 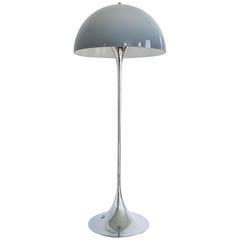 Available in wall, table and floor lamp models in white or black. Executed in matte wet-painted die cast aluminum and extruded brass. Wide range of adjustment. Glare-free illumination. High/low/off foot switch. 10W LED 2700K LED, separate driver plugs into power outlet. Ships with 10 feet of white or black cord. In-stock lead time 2-3 weeks or less. Out of stock lead time up to 10-12 weeks. Please note in-stock availability subject to change. For time sensitive orders, please inquire prior to purchasing. Elegante große zylindrische Wandleuchten, Modell 71-474 von Ella & John Meiling für Louis Poulsen, 1970, restauriert und für USA neu verkabelt.